I am delighted to share the latest news from CeRDI. In August we officially commenced a three-year research collaboration with Precision Agriculture to accelerate the adoption of precision farming techniques. With new and innovative methods for digital agricultural advancements planned over three distinct project phases, this collaboration will enable farmers, agronomists and researchers with new learnings and improved methods for farming productivity across Australia. Also during August, CeRDI and its project partners were awarded funding from the Department of Industry, Innovation and Science, as part of the Inspiring Australia – Science Engagement Program. Funding will be used to implement the National WaterbugBlitz, an important citizen science project for communities to engage with and build skills and knowledge about freshwater habitats and biodiversity. For CeRDI staff, ongoing research has led to some significant advancement across a number projects including the Dementia Care in Hospitals program, Spatial Connect, and the Central Highlands Health Justice Partnership. Some of these projects are ongoing, whereas others are close to completion, with each providing opportunities for longer-term impact research. Finally, CeRDI welcomes three new staff, filling a range of roles and positions. The recent research planning day brought staff and higher degree by research (HDR) students together to discuss areas of focus and priority as CeRDI moves forward. The day provided a valuable forum for new ideas generation and to collectively determine actions for enhancing CeRDI’s engagement and research impact in coming years. I hope that you enjoy reading this issue of the CeRDI newsletter. If you have any feedback or questions please do not hesitate to contact us. Precision Agriculture is one of Australia’s most experienced agriculture technology providers. Recently, the company has initiated a three-year research collaboration with Federation University Australia (FedUni) to accelerate the adoption of precision farming techniques in Australia. This collaboration will see Precision Agriculture and FedUni’s Centre for eResearch and Digital Innovation (CeRDI) co-creating innovative digital agriculture, spatial mapping, data visualisation and decision support tools in response to farmer and farm adviser needs across broadacre cropping, horticulture, viticulture and pasture-based systems. With operations around the country, Precision Agriculture supports more than 600 agribusinesses to drive increased farm productivity and sustainability through the practical application of spatial technologies. CeRDI is a global leader in data interoperability and has developed many award-winning web-based spatial information and knowledge portals. CeRDI Director, Helen Thompson said the volume of digital data in Australian agriculture is growing exponentially, with much of it now collected by sensors. “Data availability has vastly improved as governments and other public sector organisations adopt open data policies,” she said. “Our research collaboration with Precision Agriculture provides a great example of how research impact can be fostered through long-term research collaboration with industry. Our partnership will involve a series of applied, real-world projects focused on advancing agribusiness decision making through data, insight and action”. The first project will concentrate on digital enhancements to Precision Agriculture’s business processes and customer solutions. Innovative approaches to agricultural data from disparate sources will be adopted using international standards for the interoperable exchange of data. Internally-held Precision Agriculture data including many thousands of soil tests collected and analysed over the last 12 months will be combined with climate, terrain, soil, geology, geomorphology, drainage, satellite and other key data sets. This will enhance the evidence-base available to Precision Agriculture as a basis for recommendations in a range of variable rate nutrition and soil management solutions. “One aim of this research is to link and connect multiple layers of data in digital platform which can be viewed easily and on demand by growers. In turn, this information will drive more objective and timely decision-making such as variable rate applications of fertiliser, seed, fungicides, herbicides and other key crop inputs,” Ben Fleay said. Estimating variability in plant-available water across a paddock based on weather, soil moisture and a range of spatial datasets collected by farmers (such as electromagnetic (EM) surveys, yield maps, normalised difference vegetation index (NDVI) images), when allowing for other parameters that drive variability (including soil chemistry, pH, sodicity and texture contrast soils) will be the focus of a second project. Another area of research focus will be the development of real-world and practical use cases through a collaborative process with farmers and other end-users who understand the potential of new technologies to deliver desirable or exceptional outcomes. Longitudinal research will also be undertaken by FedUni to monitor practice change impacts associated with digital agriculture adoption. CeRDI and partners Waterwatch, Corangamite CMA, Envirocom Connections and The Waterbug Company have been awarded funding from the Department of Industry, Innovation and Science as part of the Inspiring Australia – Science Engagement Program. The National WaterbugBlitz: citizens assessing Australian waterways was announced alongside four other projects as successful recipients. It is one of only 18 successfully funded projects, selected from a large pool of applications nationally. The National WaterbugBlitz will allow communities to engage with nature, build their skills and learn about freshwater biodiversity while participating in assessing our nation’s waterway health. The National WaterbugBlitz builds upon 20 years of successful citizen monitoring in waterways by Waterwatch Victoria and other state/territory Waterwatch programs by harnessing the expertise and knowledge of participants. It will provide a new knowledge repository about waterbugs (aquatic invertebrates), which are a key indicator of river health, in order to assess the state and condition of our nation’s waterways. In commenting on the project, CeRDI Research Fellow Birgita Hansen said, “The sheer scale of monitoring across Australian waterways by governments and researchers a formidable task. So we’re looking to local citizen scientist to join in the task on an annual basis”. The National WaterbugBlitz will commence with a trial during the 2017–18 summer, followed by two full BioBlitzes scheduled for spring 2018 and again in spring 2019. A new Waterbug website linked to the Waterwatch Victoria data portal will also be established for this project whereby data and information from other programs will be displayed. 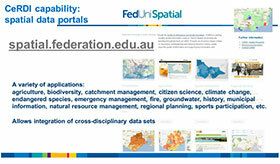 Spatial Connect is a project established through collaboration between CeRDI and the Geography Teachers Association of Victoria Inc. (GTAV). Spatial Connect involves the development of curriculum resources through the application and use of spatial technology for the geography and science curriculum for primary and secondary school students. Through this project, curriculum and resources are linked to their real-world application in agriculture, environment, geology and hydrogeology, urban planning and natural disaster planning and recovery. Real-world knowledge resources will also enable students to develop an understanding of industry, social, community and environmental issues. Spatial Connect knowledge partners include the Grains Research and Development Corporation (GRDC), Landcare networks, environmental scientists, hydrogeologists, water authorities, Waterwatch, EstuaryWatch, local government, natural disaster planning and recovery initiatives in areas including fires, landslides, floods and climate change, State Wide Integrated Flora and Fauna Teams (SWIFFT) and Visualising Victoria’s Biodiversity (VVB). A major benefit of this project is that all students will be able to receive the same educational opportunities through online learning. Until now, some students have been disadvantaged in pursuing opportunities outside of the classroom setting. Spatial Connect addresses these issues and offers opportunities for disadvantaged students such as those in more remote locations. 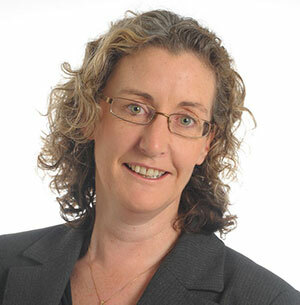 CeRDI’s Angela Murphy is working with researcher Pat Bonney to implement the key research activities associated with Spatial Connect. 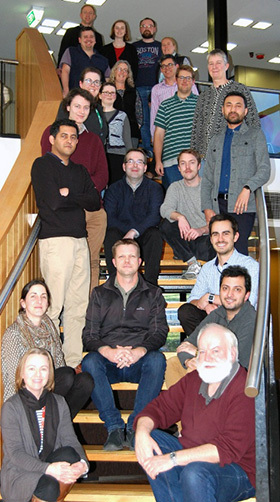 Together with staff at GTAV, they have achieved the project objectives associated with phase one, which included developing the curriculum resources to enhance science, technology, engineering, and mathematics (STEM) using spatial technologies, and facilitating access to web-based knowledge repositories. Marketing Spatial Connect to all schools is now in progress under the co-ordination of GTAV, who presented in late August at the 2017 GTAV Teachers’ Conference. GTAV affiliates – Australian Geography Teachers’ Association (AGTA) and Australian Federation of Societies for Studies of Society and the Environment (AFSSSE) – are also promoting Spatial Connect Australia-wide. FedUni will also promote the adoption of Spatial Connect in the tertiary sector via pre-service teachers in the Faculty of Education and Arts. With phase one nearing completion, funding is being sought to meet the longer-term objectives of this project and to encourage and empower students to embrace STEM through a better understanding between school, work and industry, applied to knowledge building and problem solving. Ensuring the sustainability of the project in the longer term and at the national level and across the national curriculum is now essential. In early August CeRDI held a research planning day for staff and higher degree by research (HDR) students, with the theme of the day to address CeRDI growth while maintaining culture, and to consolidate and grow CeRDI’s capabilities to achieve its future goals. CeRDI Staff at the August 2017 research planning day. Back row (left to right): Jennifer Corbett, Peter Plucinski, Angela Neyland, Patrick Bonney, David Ebbs, Chris Bahlo, Scott Limmer, Drew Collins, Sudeera Abeywickrema, Shirish Sharma, Himalaya Singh, Kathy Gamble, and Peter Dahlhaus. Front row (left to right): Andrew MacLeod, Craig Briody, Birgita Hansen, Megan Wong, Robert Milne, Nicholas Bradsworth, Paul Feely, Meghan Taylor, Judith Walters, and Helen Thompson. The first part of the planning day was dedicated to ‘setting the scene’ with Director Helen Thompson outlining CeRDI’s recent achievements and current operations, and Principal Research Fellow Peter Dahlhaus discussing the unique role of an eResearch organisation and the importance attributed to its continued to growth, including opportunities to strengthen CeRDI’s role in this space. CeRDI researcher David Ebbs provide background about the changes that organisations often go through as they grow. Activities during the day then focused on documenting CeRDI’s strengths and methods for achieving future success. A matrix of CeRDI’s six research themes (Natural Resource Management, Digital Agriculture, Hazard Planning and Resilience, Health and Wellbeing, Heritage and Culture and Regional Development) was used in combination with the Centre’s three research areas (Data Discovery, Technical Innovation and Longitudinal Impact) to assess the status of 18 potential sectors of CeRDI’s work. Areas for improvement and actions for continuing CeRDI’s success and growth were also discussed. These focussed on three initial areas: (i) research design, (ii) organisational issues, and (iii) assessment of partnerships. Plans for achieving continued success while ensuring organisational enhancements were also identified. Through this process, actions that have become the focus for development over coming months were consolidated. The planning day proved to be another successful CeRDI event and thanks is extended to all who participated so enthusiastically on the day. The benefits of working together collaboratively will ensure the planned actions will be achieved in order to maintain and extend CeRDI’s role as a vibrant research centre. 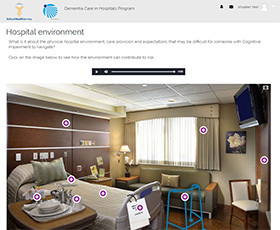 The Dementia Care in Hospitals Program (DCHP) aims to improve the care of patients with cognitive impairment within the acute hospital setting. The program, led by Associate Professor Mark Yates, was first introduced at Ballarat Health Services (BHS) in 2003. Cognitive impairment includes a range of thinking and memory difficulties, and is often unrecognised despite affecting up to one-third of hospital patients. This leads to higher rates of adverse outcomes. The DCHP promotes practice change through education that aims to improve the awareness of cognitive impairment and promote communication with patients with this condition. Associated education resources promote an all-of-hospital approach, with tailored education for both clinical and non-clinical staff to improve the support, communication and care of patients with cognitive impairment. Recently, the DCHP was expanded into a national project with 29 hospitals in Victoria, the Australian Capital Territory, South Australia and Western Australia implementing the program. As part of the national rollout, an electronic education program has been developed by FedUni through CeRDI and the Faculty of Health (Prof Britt Klein) in collaboration with BHS, to improve the accessibility and sustainability of the program into the future. The DCHP online education program was developed in the Moodle learning management system with capabilities to track and monitor which staff have completed the training program. The appearance and layout of the online education program is relatively unique – having been customised by the CeRDI technical team to ensure its appearance and functionality would support clinical and other hospital staff in easily working through the online program. The training modules incorporate text, audio and video content interspersed with interactive content and activities including multiple choice quizzes. The DCHP e-learning module has recently been reviewed by staff at BHS and will soon be introduced in four hospitals across Australia to pilot the new mode of delivery. Ongoing research is being conducted by BHS to measure the knowledge, culture and practice changes associated with the introduction of the DCHP e-learning module. Most importantly, the research will examine patient outcomes. 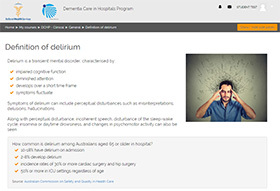 It is anticipated that the DCHP e-learning module will improve the care and outcomes for patients with cognitive impairment now and into the future. This collaborative project between CSIRO Land and Water, CeRDI and ThinkPlace aims to explore proponent data generation as part of the referral process under the Commonwealth Environment Protection and Biodiversity Conservation Act 1999 (EPBC Act). The primary goal is to understand the value and nature of environmental impact assessment (EIA) data and their potential for reuse in other areas of government decision making. The EPBC Act is the key piece of national legislation for the protection of biodiversity and the environment. It is administered by the Australian Government Department of Energy and Environment. Project development proposals that have potential to impact matters listed under the Act are referred to the Environment Minister for determination. There are nine Matters of National Environmental Significance (MNES); the two most commonly assessed are (1) nationally threatened species and ecological communities, and (2) migratory species. EPBC referrals usually require field surveys and site assessments to provide quantitative data on potential environmental impacts of a development proposal. In approving development applications, conditions may be attached that require monitoring and reporting on possible post-approval impacts. Documents lodged with the Department as part of the referral, assessment and monitoring process are based on often significant volumes of data. The value of proponent data, generated through the EPBC Act EIA and approval process has not been quantified or well described. Furthermore, the degree to which proponent data is captured by state/territory governments is not well documented. The initial stages of this project focused on reviewing a selection of EPBC referral cases to formulate a broad overview of the characteristics of these proposals, and the types of data accessed or generated. Biodiversity data (flora and fauna) represented the majority of new datasets generated, however, no datasets were made available to the Department in structured, machine readable and reusable formats. The second stage of the project is now underway, and is focusing on conducting a detailed analysis of two EPBC referral cases, that represent large and potentially data complex case studies. The anticipated outcomes of this stage will be comprehensive documentation of the value (in terms of accessibility and reuse), extent (spatial, temporal and taxonomic resolution) and scope (data standards versus data themes) of data generated or required to be generated as part of approval conditions. In conjunction with the EPBC case reviews, the project will also document state and territory environmental assessment processes in the context of EPBC. In so doing, the project seeks to understand the value of data generated through jurisdictional processes, how (or if) data flows between the jurisdictions and the Commonwealth, and what potential reuse value exists in these data. CeRDI has recently been appointed to two significant national programs. Firstly, as a consultant to the Farm Co-operatives and Collaboration Pilot Program being delivered by Southern Cross University, on behalf of the Australian Government. Through its appointment CeRDI hopes to work on opportunities across a range of services in conjunction with farmers and farmer groups to conduct needs assessments, standardised expert support, customised expert support and case management. Co-operatives and other collaborative business arrangements will assist farmers to own and control more of the food supply chain themselves, delivering greater returns at the farm gate. The Farm Co-operatives and Collaboration Pilot Program will enable farmers to access knowledge and resources on different collaborative arrangements that work for their business. This appointment is until 2018. CeRDI has also been appointed to Grains Research and Development Corporation’s (GRDC) panel for Expert Consultancy Services. This appointment offers a range of new and exciting opportunities for CeRDI to work collaboratively with GRDC. 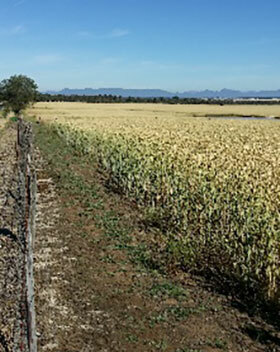 To fulfil its panel requirements, CeRDI will consult with GRDC to develop reporting milestones for each project. CeRDI will outline services it can perform for GRDC through this role. This includes strategic planning for digital agriculture research, development and extension, web-based spatial information and knowledge portals, decision support tools for agriculture, digital tools and platforms to advance precision agriculture adoption and longitudinal impact research to understand how digital innovation achieves sustained practice change across the agriculture sector. This appointment is for three years and extends the current, well established relationship that CeRDI has with GRDC and through the Online Farm Trials (www.farmtrials.com.au) and Online Final Reports (www.grdc.com.au/research/reports). 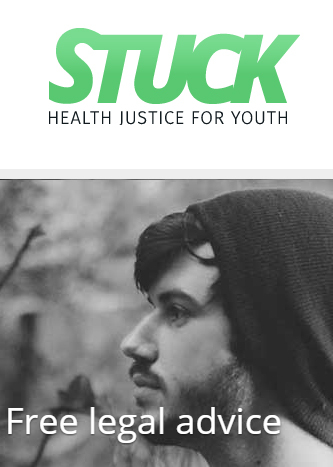 The CeRDI-led Health Justice Partnership for Youth is an integrated health justice service for young people in the Central Highlands that has been extended until December 2017. The program, which represents a collaboration between CeRDI, Ballarat Community Health (BCH) and Central Highlands Community Legal Centre (CHCLC) delivers an integrated medical and legal service with a lawyer from CHCLC based across BCH sites. The program provides early intervention for legal and health issues to improve the outcomes for disadvantaged young people experiencing multiple health and legal issues. Project leader, FedUni’s Margaret Camilleri commented on the importance of the extension of this project, “The commitment of project partners to extend the program ensures the valuable work being undertaken with young people through the program, continues. We are currently exploring options to ensure the program extends beyond 2017 enabling this integral service to continue into the longer term”. Researchers at FedUni are in the final stages of documenting research outcomes, captured throughout the program. 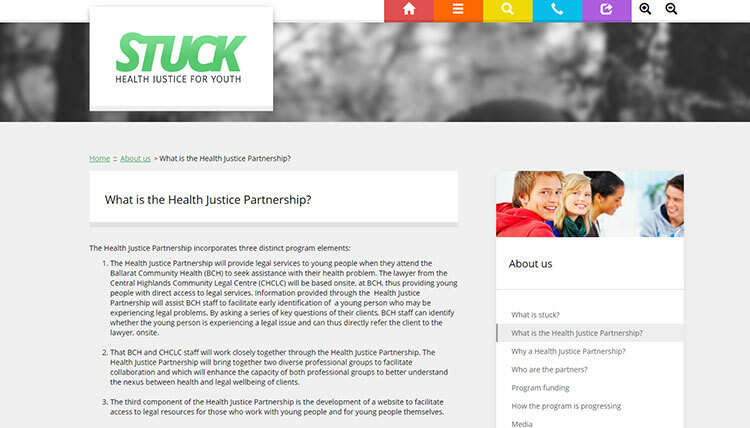 Since it was first launched in mid-2015, over 130 young people have received legal services through the HJP. Referrals to the program are being received from organisations that directly supporting young people across the region. Young people accessing the service often have a range of complex legal issues, and in some instances, multiple legal issues. Feedback captured through the research from young people, observations of staff from referring and partner agencies have identified that the program is having a positive impact on young people in the region. The project was funded by a major grant from the Victorian Legal Services Board and Commissioner. 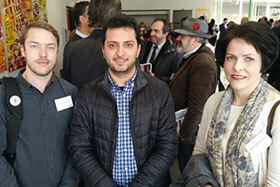 New Staff in CeRDI: CeRDI has recently appointed three new staff to join its team. Dr Megan Wong, Dr Angela Newland and Bruce Simons have all been appointed to research roles within the Centre. Megan joins CeRDI after completing her PhD investigating soil biology with vegetation and land use change across the Riverine Plains of Victoria. Megan is assisting with research activities linked to the Precision Agriculture partnership. Bruce Simons has spent 30 years working in the geosciences as a geophysicist, mostly with the Northern Territory and Victorian geological surveys. 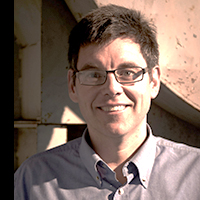 Bruce has spent the last six years of his career working for CSIRO collaborating with organisations to develop groundwater, soil, marine, gazetteer, water quality, native vegetation, and electricity and water utility data exchange standards. Bruce will be assisting CeRDI engagement in international collaborations including Open Geospatial Consortium (OGC) data access standards in areas including soil and agriculture. Angela is a geo-archaeologist with a strong background in cultural heritage in research and consultancy. Angela is assisting the CeRDI team on a range of projects including Visualising Victoria’s Groundwater. Unprecedented volumes of data are now available to decision models and tools that can be used to grow the profitability of Australian agriculture. The challenge is in providing equitable access to all the available data – public and private – in a seamless manner, regardless of its disparate custodianship and collective heterogeneity. With support from ANDS, the Centre for eResearch and Digital Innovation has been liberating unique agricultural datasets and making them available through Research Data Australia. Congratulations to all CeRDI HDRs who actively participated in the recent FedUni HDR Conference in July. The title of the conference was Making your Vision a Reality with post graduate students Chris Bahlo, Pat Bonney, David Ebbs, Alison Ollerenshaw, Shirish Sharma and Himalya Singh all providing oral presentations and/or poster presentations at this important post graduate event. PhD student David Ebbs has been awarded an internship with City West Water for the next four months. 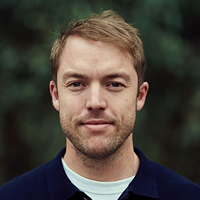 The project will involve contributing to the development of a strategy for the reuse of sewerage in Melbourne over the next 50 years, an area that is closely connected to David’s PhD research (link here to David’s profile: http://www.cerdi.edu.au/cb_pages/david_ebbs_postgrad.php. David’s internship has been supported by the Australian Mathematical and Sciences Institute and City West Water. Meghan commenced working with CeRDI in 2011 after completing her VCE. Initially working in an Administrative/Project Officer role, she transitioned into a Research Officer role in early 2015. Meghan has recently completed a Bachelor of Science (Chemistry)/Bachelor of Biomedical Science at Monash University, which has given her a broad range of insight into a range of domains. She is particularly passionate about areas of public health, health systems, quality improvement, evidence-based practice and health data. Through her studies and work experience Meghan has developed skills in qualitative research. Within the CeRDI qualitative research team, she often takes on responsibility for writing and submitting ethics applications, performing literature reviews and background research, and sourcing, extracting and analysing government and other health and community datasets. This project is liberating health and social data from government and other data sources that are not usually available to the public (e.g. aggregated and de-identified police datasets) to support greater insight into the ‘causes of the causes’ (social determinants of health). 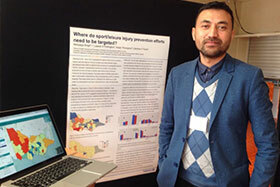 The overall aim of this work is to support partner organisations in more easily accessing social and health data in a visual and interactive way to gain insights, view trends over time and help plan and develop approaches or interventions to improve health and social outcomes in regional communities. In addition, it aims to enable better responsiveness to community need by integrating data such as waiting lists, hospital presentations, and police attendances, more regularly rather than waiting two or more years for data to be released. Meghan is guiding the Wimmera Information Portal as it transitions from a pilot to a programmatic research program, including securing funding support from project partners along with other funding sources. Meghan is excited about the future development of research within CeRDI under the ‘Health and Wellbeing’ research theme and about measuring the impact of eResearch on the health and vitality of regional and rural communities. Patrick commenced his PhD at CeRDI in November 2016. Before this he was a freshwater research officer at the Centre for Aquatic Pollution Identification and Management (CAPIM), based at the University of Melbourne. For his PhD research, Patrick is exploring the use and value of citizen science in freshwater management. Involving volunteers in scientific investigations is increasingly viewed as being integral to environmental management and government policy planning through two distinct, but complementary, pathways: (i) by providing long-term monitoring data to inform waterway condition, and (ii) by increasing volunteer knowledge of stream values to better equip them in freshwater planning processes. However, a lack of observed linkages between volunteer data and management actions, and limited evidence that involvement improves access and willingness to decision-making processes, flag significant shortfalls in the alignment between policy and practice. With a focus on community-based monitoring groups in Australia, Patrick hopes to deliver an increased understanding of the relationship between citizen science and freshwater management and the characteristics of such groups that induce or limit their success. Patrick is supervised by Dr Angela Murphy (CeRDI), Dr Birgita Hansen (CeRDI) and Dr Claudia Baldwin (University of Sunshine Coast) and is funded as part of the Regional University Networks (RUN) Water Futures Fund. Pat is currently working to confirm his candidature by November 2017.